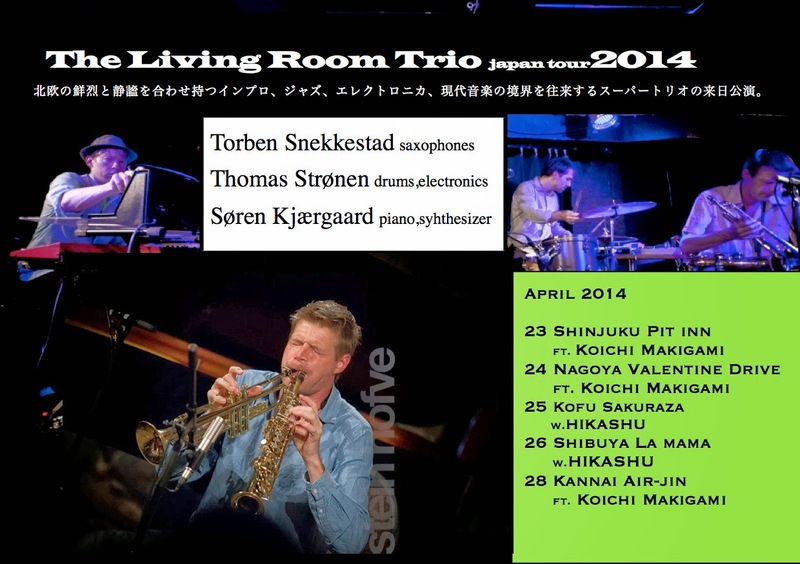 Makigami Koichi has organized a Japan tour of a European improvisation group called The Living Room Trio in April this year. This is the first time they ever play in Japan. 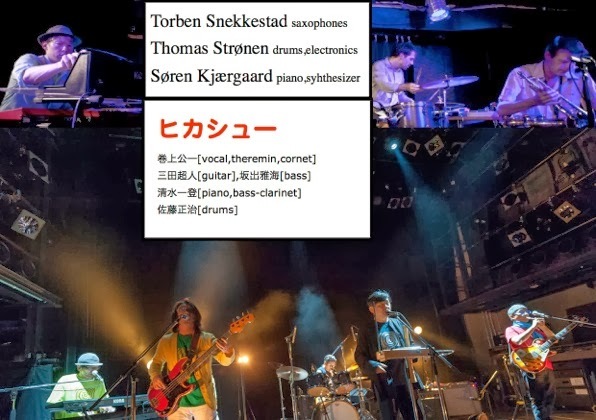 The Living Room Trio is formed in 2009 and consisted of Toben Snekkestad on saxophones, Thomas Strønen on drums, and Søren Kjærgaard on piano and synthesizer. Norwegian saxophone wizard Torben Snekkestad formed a new project for the Copenhagen Jazzfestival in 2009 called “The Living Room”. The trio consist of some very exiting musicians from the Nordic new music/ jazz/improv/electronica scene. The ensemble has now toured in Scandinavia and have developed into a powerful unit, with a unique sound, based on improvisation and compositional frameworks. The trio have also played concerts in Norway with the japanese vocal master Koichi Makigami. These three young talented musicians are armed with strong individual improvisations, subtle structures, highly-charged grooves and interactive curiosity! Makigami has been playing with the trio on and off for years, and at last, we will come to know how they actually sound like. Of course, Makigami will sit in all the gigs, and some dates will have a guest, Janmah Shimamura on guitar. 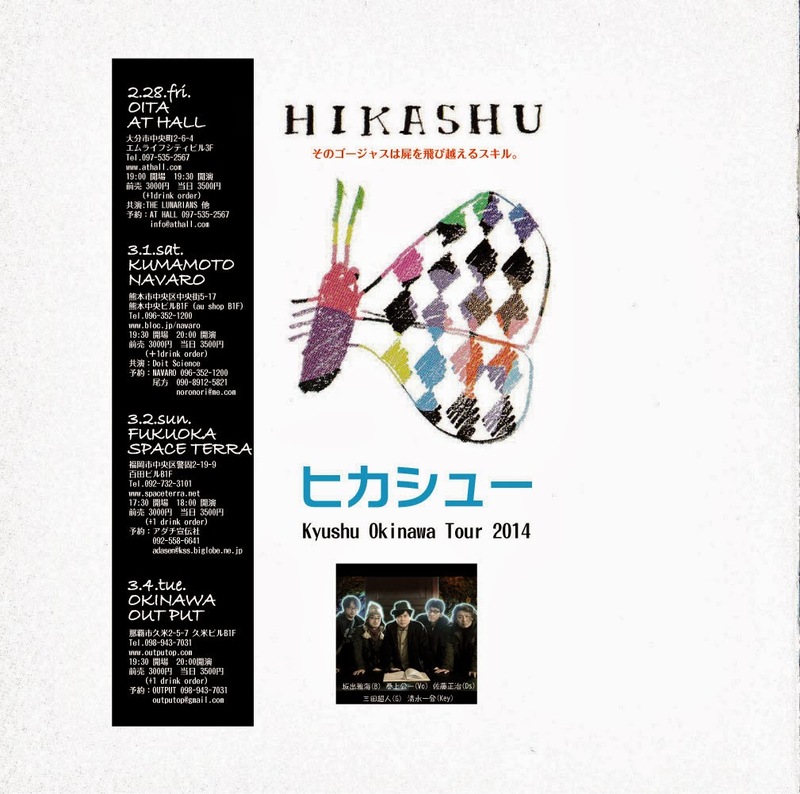 Also, the tour includes the two double-bill gigs with Hikashu. On March 9, Makigami Koichi will hold an intimate concert at his hometown, Yugawara. Originally he was scheduled to play that day in Kyzyl, the capital city of Tuva Republic, but the event was postponed to October. Having already booked musicians, he decided to play with them at his hometown instead. The musicians are: Makigami on voice and shakuhachi, Shika Udai on cello, Yanagiya Koharu on vocals and shamisen, and Sato Masaharu on percussion. You can expect a lot of music - from khoomei, siberian mouthharp to traditional popular songs of 18-19th centuries Japan (Edo period - wikipedia). And if you live in Tokyo, Yugawara (or its neighboring town, Atami) is definitively worth to pay a visit. Being famous for hot springs, Yugawara is one of the most popular spa resort in the greater Tokyo area, and it takes an hour and half from central Tokyo via train. March of Yugawara is a high season for its famous ume (Japanese apricot) trees and people gather to see the splendid scenery. March 9 is Sunday. So it's a nice way to spend a holiday to visit a beautiful place, take a traditional bath (there are lots of them), then enjoy a special concert. Moreover, the gig is admission free (donations welcome!). Let's have a nostalgia trip with great music. 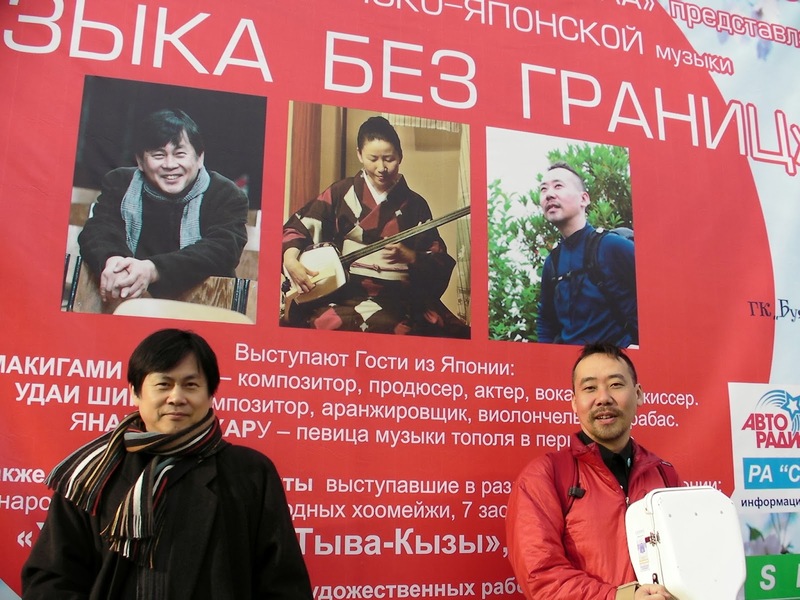 "Yugawara Ume Trees Party - Musical Journey from Edo to Siberia"
Starting late this month, Hikashu will tour the southern islands of Japan, Kyushu and Okinawa. Especially the Okinawa gig is noteworthy because this is the first time for them to play the beautiful isle. The first time in 36 years! 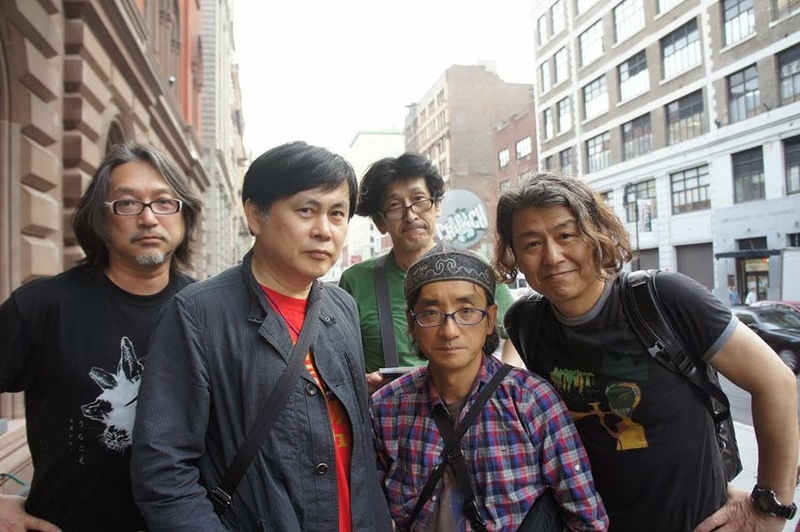 Hikashu in NYC, May 2013. Here's a translation of the words on "Chakra Biraki." The original pronounciations follows. And everybody just hung their socks. and the muscles of Indians, all filled the socks. Would you tell me the way how I should pray? Maybe even if it's disappointing. There's such a mess in the heads. The gum I'm chewing is also a mess. Henzel and Gredel ate cakes and were taken in. Even such perils have no meaning for such insensible people. How I should hung the socks in my room? Please teach me such an enjoyment. Please don't waste your life for doing as such. An alley of Christmas, a carcass of Santa Claus. The socks in my room has a lot of holes which someone unknown made. Please let me know the way how I should spent the day? But people, does that mean there are no mysteries of life? Have all of its wonders become obsolete? No! Life is not without its mysteries! Let's go up front. This mystery is not a dream. It is what I've discovered in my journey to the South Pacific. I hope you enjoy the two lovely fairies. Let me open your chakra. Be here without a name. A full of difficulties ahead. Bandana turned yellowish, bandana turned yellowish. The heyday of youth has been over. It's hard to lead a social life. Space and existence are just out of understanding. Soap bubbles burst, soap bubbles burst. Infrastructure is shaky, nfrastructure is shaky. World economy is a mess. The situation are still recognized superficially. Tenioha and nǐ hǎo, Tenioha and nǐ hǎo. Wondering if the spirit of language is working. The master refused, the master refused. Note: Tenioha are particle words in Japanese grammar. It's actually consisted of four words - te, ni, o, and ha. They may be used as one word. Nǐ hǎo (你好) is "hello" in Chinese. See wiktionary for details.